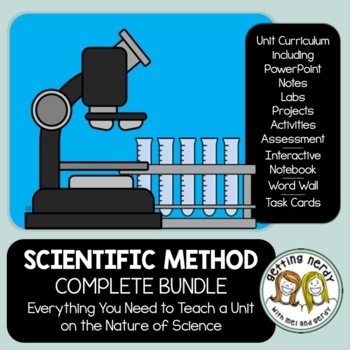 You're ready to teach with this comprehensive bundle for teaching the Nature of Science and the Scientific Method. Engage your students with our animated PowerPoints and aligned lessons, 20 Interactive Notebook activities, a visual word wall with roots, suffixes and prefixes AND English and Spanish translations, and a set of versatile task cards aligned with the lessons taught in this unit. You're all set! Because we have created many of our own graphics or have purchased licenses to other graphics with permission, we cannot offer our resources in editable format unless otherwise stated. Failure to comply is a copyright infringement and a violation of the Digital Millennium Copyright Act (DMCA). Clipart and elements found in this PDF are copyrighted and cannot be extracted and used outside of this file without permission or license.